glorify Him by enthusiastically chanting His Thousand Holy Names (Viṣṇusahasranāma)." ● bhūta-bhāvana – He is the supreme well-wisher who promotes everyone’s ultimate welfare. ● akṣara – He is infallible; eva ca – even so. ● puruṣottama – He is the Supreme Person. ● īśvara – He is the supreme controller of all living entities. ● dhatur uttama – He is the Supreme Person. ● dhruva – He is eternal. ● maṅgalam param – He is the supreme auspiciousness. ● madhusūdana – remembering Him ends the repetition of birth and death in the material world. ● ātmavān – He maintains an eternal loving relationship with the liberated souls. ● śarvadārśana—He reveals His form, qualities, and everything about Himself to pure devotees who have full confidence in the instructions of the spiritual master and the statements of the Vedic literature. ● sarva-yogaviniḥsṛta—He is always free from material contact. ● vṛṣākṛti – His transcendental form is supremely handsome. ● mahā-tapā – He is Himself the cause of the multiple distresses of material existence. ● veda-vit kavi – He is the most expert Vedic theologian, philosopher and poet. ● catur-bhuja – He manifests as Lord Viṣṇu, who holds a conch, disk, club and lotus in His four hands. ● punar-vasu – He appears again and again within the creation to protect His devotees. ● yama – He resides always in the devotees’ hearts and minds. ● mahā-bala – His great prowess can thwart or bewilder anyone. ● mahādri-dhṛk – as Lord Kūrma, He held up the Mandara Mountain while He and the demigods churned the Ocean of Milk. ● govindām pati – He removes all obstacles from the path of His devotees with His spiritual effulgence. ● prajā-pati – He is the protector and master of Brahmā, Śiva and all other living entities. ● surārihā – He kills the demons who are always inimical to the demigods and devotees. ● udāra-dhī – He is very generous. ● sahasra-pāt – He has uncountable thousands of feet. ● dharaṇī-dhara – He is the maintainer of the Earth. ● nara – He is the Supersoul who resides in the hearts of all beings. ● siddhi-sādhana – The saintly devotees become free from all impediments and attain success in their devotional activities simply by remembering Him. ● śruti-sāgara – He is the great ocean into which all the rivers of Vedic knowledge converge. ● prakāṣana – He is the original cause of the cosmic manifestation, and He rescued the Vedas from the demons Madhu and Kaiṭabha. ● bhāskarā-dyuti – He defeated the demons Madhu and Kaiṭabha with the supreme power of His effulgence. ● satyadharma-parākramaḥ – He defeats the speculative impersonalist philosophers and establishes the actual truth of spiritual variety within oneness. ● prabhu – He is omnipotent. ● ananta-jit – He defeats unlimited numbers of atheists. ● mahī-dhara – He lifted Govardhana Hill to protect the residents of Vrajabhūmi. ● pratiṣṭhita – all the cowherd men respect Him because He is the son of Nanda Mahārāja, the king of Vraja. ● purandara – He is the destroyer of the demons. Gokula appears like a great lotus flower. ● garuḍa-dhvaja – His chariot carries a battle-flag marked with the emblem of Garuḍa. ● samitiñjaya – He is always victorious in battle. ● amitāśana – He assumed a gigantic form and ate all the cakes, condensed-milk products and other offerings the cowherd men made to Govardhana Hill. ● guha – He desires to perform confidential pastimes with the residents of Vrajabhūmi. ● śubhekṣaṇa – His merciful glance is the beginning of all auspiciousness. ● dharmavid-uttama – He is the maintainer of Manu and all others who know the truth of spiritual life. ● adhokśaja – He is beyond the reach of blunt material senses, and He killed the demon Śakaṭāsura while resting beneath a cart. ● viśva-dakṣina – He gives the entire world, and even Himself, to His pure devotee. ● mahā-dhana – He is the master of all wealth and the greatest giver. ● samīhana – pious and intelligent persons aspire to attain Him. 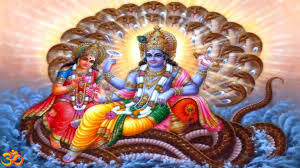 ● jñānam uttamam – He is the supreme object of knowledge. ● vidāraṇa – He easily split Bakāsura’s beak as if it was a blade of grass, even though Bakāsura was as big as a mountain. ● dhaneśvara – He is the master of numberless surabhi cows. ● kṛta-lakṣaṇa – He reveals His original form to the most exalted devotees. ● deva-bhṛt guru – He is the teacher and maintainer of Brahmā, Śiva and all the demigods. ● bhūri-dakṣiṇa – on His birthday celebration He gives abundant charity to the brāhmaṇas. ● sātvatām pati – He is the protector of the Yadus, and the Lord and master of the great souls who preach the truth about Him for the benefit of the conditioned souls. ● antaka – even during the destruction of the universe, He is splendidly handsome. ● tri-vikrama – He is the supreme goal described in the three Vedas. ● kṛtānta-kṛt – He was as formidable as eternal time when He killed the demon Hiraṇyākṣa. ● cakra-gadādhara – He carries the sudarṣana-cakra and the kaumodakī club. ● mahā-manā – He grants liberation to His devotees. ● gati-sattama – He gives the most valuable spiritual destination to those who take shelter of Him. ● ayonija – Sarasvatī, the goddess of learning, personally appeared in His words. ● vṛśāpriya – after Ariṣṭāsura was killed, He carefully protected the cows and bulls of Vṛndāvana, which are very dear to Him. ● śrīmatāmbara – He is the best of all eloquent orators and the best of the cowherd boys of Vraja. ● lokatrayāśraya – He is the shelter of Gokula Vṛndāvana and all the three worlds.